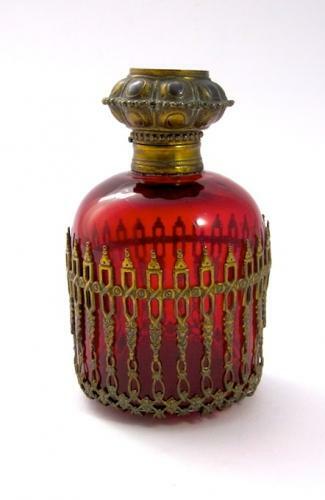 Pretty French 19th Century Ruby Red Scent Bottle with Intricate Dore Bronze Mounts Around the Body. These Perfume Bottles were Collected as Souvenirs by Noble Ladies on their Grand Tour of Europe. Unusual Dore Bronze 'Fencing' Wrapped Around the Body of the Perfume Bottle. Deep Rich Ruby Red Crystal and Fine Eglomise (Reverse Painting on Glass) Miniature showing Place de la Concorde and L'Arc de Triumph in Paris.